I made this cake for my lady boss wedding. 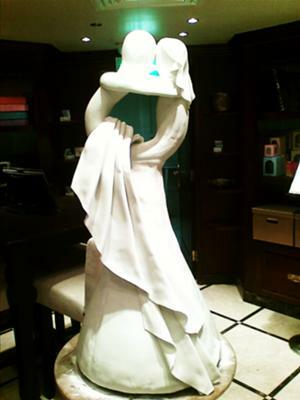 She asked me to make her wedding cake modeled from a ceramic wedding topper. She wanted the cake to be all edible even the upper part of it. At first, I had hard times of doing the plans, and I made it! I called this Carry-Me. That is so beautiful! You are so talented! Thanks a lot for the compliments! Every part was cake even the heads and arms except the body parts which i made them out of woodsheet in its shape to hold the heads and arms. More of my creations at www.cakescape.wetpaint.com. It's my pleasure!!! Love your creations john and was wondering which part was the cake or was the whole thing a sculpture. What a wonderful work of edible art! it fills me with a sense of wonder at the possibilities that exist for me at the start of my adventure into this wonderful world of sugar-craft. Your cake looks awesome. It is extermely creative and inspiring.